Stonehedge Indoor Golf offers six, widescreen golf simulators which includes a private suite. 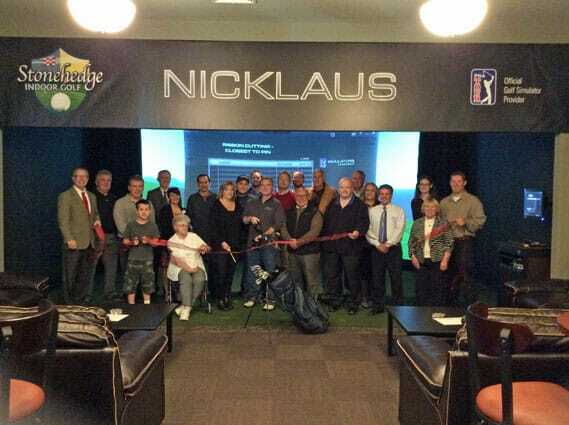 The simulators from aboutGolf – the leader in high-definition, virtual golf technology and the only vendor whose golf simulators are officially endorsed by both the PGA TOUR and the Golf Channel. Stonehedge Indoor golf also offers virtual mini golf, 11 big-screen HDTV’s to watch your favorite sporting events, as well as food and beverages. They also offer leagues and lessons. Future plans include adding NASCAR simulators. Pictured (l-r) front: Tom Donahue, Noah Collen, Sandy Bendig, Ginger Bendig, Shawn Bendig, owner, Rep. Larry Cupoli, Rep. Tom Terenzini, Sen. Brian Collamore, Joan Hill and Brennan Duffy. Back: Greg Nelson PGA Pro, Tom Leypoldt, Ken Nelson, Todd Collen, Owner, Trevor Bendig, Justin Perkins, Bill Ackerman, Brian Perkins, Jerry Hansen, Chuck Rose, Debbie Grembowicz, Alderman Melinda Humphrey.